Quite often the startups contact us with the same request: they have a great idea, have some seed funding to create an MVP and need a good team to make it real. They often lack the technical background to know how the product must tick, as well as hands-on experience with leveraging the AWS, GCP or Azure infrastructure to maintain the ready app in production. Despite this, we are able to provide the first-class services that ensure the success of our customers’ startups and business goals. This is the project management workflow, done IT Svit style. It usually takes us around 3-4 weeks to gather the team meeting all the customer’s requirements and expectations of the product features. After that time we clearly understand what the customer WANTS, and what he/she actually NEEDS to get the product up and running quickly. We understand the technology stack and toolkit needed to build and release the MVP or a full-scale product. Knowing this all, we understand what specialists are needed to fill in the roles. We propose the product architecture and the expected modus operandi of all the components to ensure the stability of operations and ease of management. 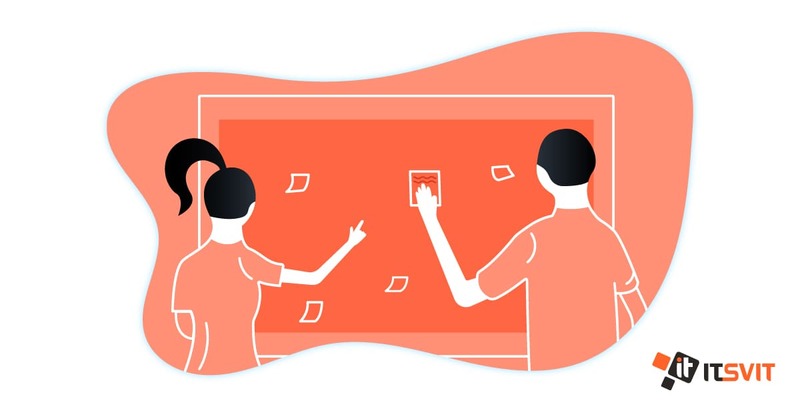 By forming a holistic vision of the future product and infrastructure we ensure the customer gets the features he wants along with uninterrupted end user experience. We also provide the list of the specialists needed to get the job done. 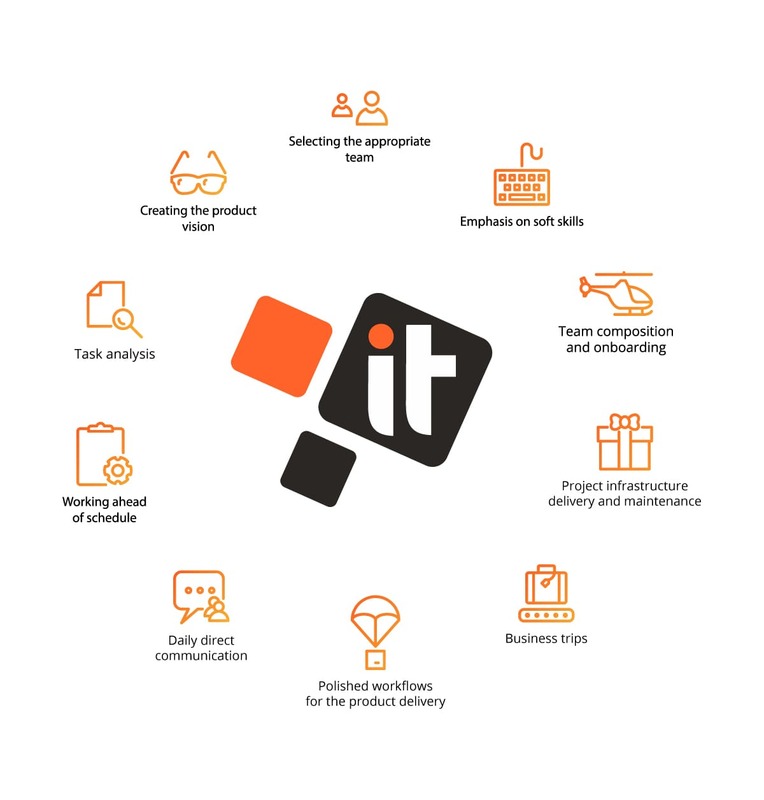 IT Svit recruiting team uses our product, HRM system, to sift through the profiles of more than 3 thousands of suitable applicants and select the ones most fitting the project specs and most motivated to get the job. These applicants are eager to work with a reputable DevOps services provider listed amongst the top 20 MSP’s worldwide and one of the leaders of the IT outsourcing market in Ukraine according to international business rating and reviews agency Clutch.co. Our rich experience and correct approach to building the team is often noted by our satisfied customer in their 5-star reviews. We make a special emphasis on soft skills, as we know their importance by heart. The team must communicate and collaborate to be efficient, so the better the team members are able to work together, the faster the working product will be ready. By paying sufficient attention to soft skills, we ensure the team members are both skilled professionals and good colleagues, ready to devote sufficient effort to ensure the project success. We conduct a series of interviews with the candidates at our office and shortlist them for the customer’s convenience. The client gets to choose from several best fits based on our recommendations to ensure the final team will be a good one regardless of the talents engaged. Then the team members approved by the customer go through the quick onboarding process. They get acquainted with the project requirements and expected architecture, so they are able to suggest solutions for potential bottlenecks if need be. Many of our customers have their products deployed on AWS, GCP or Azure, or want their future apps to be deployed to these cloud platforms. These web or mobile apps might be developed using React, Node.js, PHP or Laravel or any other framework. For example, you might already have the iOS / Android/web development teams on site, you will still need the DevOps team to launch the product on the cloud platform and support the further maintenance. IT Svit houses big and competent DevOps and Technical Support teams to ensure the stable infrastructure operations and timely product support if needed. We specialize in delivering cost-efficient IT infrastructure for companies of all sizes, so our DevOps specialists are able to offer the best solution both to a startup and to a full-size enterprise. To say even more, almost any project nowadays involves a huge deal of Big Data, Machine Learning (ML) & Artificial Intelligence (AI). As it was announced on the latest AWS Summit 2018 London, AWS becomes the Big Data & AI-oriented company. To leverage the full extent of the platform possibilities, the businesses should employ Big Data engineers and data architects to be able to provide better customer outcomes. Luckily for our customers, Big Data is another field of expertise of IT Svit and we are ready to deliver the full cycle of services for startups and any other businesses. We can setup Hadoop, Spark, Cassandra, create web crawlers and scrapers, and use any type of ML model to provide precise and valuable business analytics. Once the customer approves the team composition, they get to meet each other and establish personal contacts. Either the team goes on a paid business trip to work at the customer’s location for a couple of weeks, or the client visits our office to get a hands-on experience of interacting with the team and clarify the project specs. This is a popular practice in today’s outsourcing workflows, making sure the team is on the same page with the client and his/hers on-site team. Once the team begins working seamlessly and returns to the remote work scheme from our office, we follow our polished internal workflows to ensure the timely delivery of required product features. Ample first-hand experience allows us to prioritize the tasks correctly to ensure successful sprint completion. For example, each team member writes the daily plans in the morning and delivers the daily reports in the evening. This helps evaluate the project progress correctly and apply preemptive corrections if need be to ensure timely project completion. Our Team Leads (TL) act as product stakeholders and control the product development process. They inform the customer of the progress with daily direct communications in chats, project management systems (Jira, Trello, Redmine, etc.) or Skype calls. The customer always knows what the team is up to, if any roadblocks emerge and what is being done to overcome the challenges. Such approach to project management ensures our teams always deliver the results on time, and quite often deliver ahead of schedule to ensure the customer stays on the safe side. This is proved by multiple 5-star IT Svit customer reviews on Clutch and the fact that nearly 70% of new customers are referred to us by previous satisfied IT Svit clients. The TL was responsible for the product architecture and infrastructure design, as well as choosing the team members and communicating with the customer. As he had a clear vision of how the product should work and what technology should be used, he was able to come up with the list of needed skills and interview the potential applicants. Such approach to selecting the team has helped us to shorten the time needed for the project launch by 30% and allowed the customer to save around 25% of overall project budget, as we were using the AWS infrastructure efficiently and without unneeded delays. Our team was almost always ahead of schedule and the high-quality product was delivered on time. The customer was completely satisfied and we are now engaged in ongoing development and maintenance of the product.